Countervailing Powers: Unions, Corporations, Government, etc. Those with power sometimes do not know how powerful they are while those without power know very well how weak they are. The have's always have and the have-nots, have not but they do their best to survive. So it has been from the beginning of time as the law dictates, "survival of the fittest." Are humans above it all? Is there just a little bit in a human that is animal. Is it possible that part really is not as good in its spirit as man's best friend, the wonderful creature Canis familiaris domesticus, most often referred to simply as dog,. Are humans or dogs more inclined to do the right thing if called upon accordingly? Tough question! I look into my wonderful dog's eyes and I always know which way he is going to go. As we go back to the turn of the century we find certain humans who had lots and lots of material goods as well as lots of power. These folks were truly captains of industry and they were referred to using that term as well as by the less flattering term of "Robber Barons." We all know who they are from our American History classes. John D. Rockefeller, Milton S. Hershey, J.P. Morgan, Andrew Carnegie, and Cornelius Vanderbilt were the headliner robber barons of the period. They were all shrewd, cunning, and some might add, "heartless" businessmen. They had immense power and ran huge companies and hired many people to work in their facilities. For the workers, it was good because they had a job and they were able to provide for their families, though just barely. For the families, it was not so good because the head of the household had to work most of their waking hours every day of the week. Only the Robber Barons held the power in the period before and immediately after the turn of the twentieth century. The irony is that the workers did not really understand their value in the wealth process. The workers were the means to the Barons' wealth. Yet, they had no power, and in most cases were living in destitute circumstances. In the power game, the barons had all the power and the workers had none. -- zero, nada, zilch as they like to say today. Thus, there was a power void. Whenever there is a power void, it will eventually be filled as the seemingly powerless realize that in numbers, they have power. In the days of the Robber Barons, they were able to essentially enslave the workers because there was no notion of a countervailing power, and no means of achieving it even if the notion were well known. Wikipedia authors often get it right, " Modern economies give massive powers to large business corporations to bias this process, and there arise 'countervailing' powers in the form of trade unions, citizens' organizations and so on, to offset business's excessive advantage." The greed exhibited by one corporation during this period forced another corporation to be as greedy as the first or go out of business. So, corporations and the men (at the time) who ran them chose to be as greedy as they could be. They viewed it as much a matter of survival as a means to success. Labor arbitrage creates big hurts in lots of regular people. In many ways in from 2007 to 2011, the "new immigrants," undocumented workers," "illegal foreign nationals," or quite simply, "illegal aliens, have been driving American wages down again to the point of labor arbitrage, and it is not by accident. The Robber Barons are documented as having exploited Americans, using sweatshops with abysmally low wages. They were fully in control of the labor arbitrage. If workers were scheduled for just 10 hours shifts per day, this would be considered an easy shop. That wa not the typical case, however. More often, the work periods included 18-hour work shifts at slave wages without overtime pay. The abuses of the period included child labor; inadequate safety, minimal health and environmental safeguards; and of course, no pension or health benefits. This was the deal for many Americans at the turn of the century. If workers banned together in any way to change their plight back then, and they were discovered, and they were discovered, they would be summarily discharged for union organizing. So, it was a bad situation and there was little chance for relief. There were a lot of reasons for families to just accept it as it was dealt. The Robber Barons assured that those who accepted their dire circumstances were able to survive by having employment, though in the most meager ways. At the turn of the last century, however, there was a huge void. People were hurting and it seemed they were helpless. However, every now and then, brave men would come by to help. These were union organizers and they tried their best to fill the void. The union organizers intrinsically knew that giving power to the worker was the only solution to labor arbitrage. Employees knew that the best they could do would be to just barely make it if they made no waves at all. If they made some waves, such as fraternizing with a labor organizer, they might be left with nothing. The choice to organize was difficult for employees as the risks were very high. The early Union employees were very brave souls with a real mission. They suffered and all suffered when trying to take the smallest action to avoid the tyranny of the Robber Barons. Can you imagine working for the Baron and trying to overcome the Baron at the same time? There is an idea that if a decent wage were paid to the workers-- not substantially larger but seemingly generous, the Robber Barons would have been able to keep their gold and the worker would have achieved the opportunity to live more hours per week with family, rather than at the factory. But, with no countervailing power, the Robber Barons were more concerned about competing against other Robber Barons. They had no regard at all for the power of the employee who was merely part of the means of production. The employee simply had no power. Once the countervailing power had been duly established, neither corporations nor unions controlled the scenario. Both were very powerful, and the unions did their best for the employees while the corporation did its best for the former baron class citizens. Of course, when it chose to do so, and only when it was inclined, this third party known as the government, did claim to represent ordinary people. However, most of the time, as we have all come to realize in 2011, the temptation of the politicians to feed themselves off the public treasury was so overwhelming that they had little time to include we the people in their thought process. The corporations and the unions fought for the control of this powerful entity known as the government. Whoever won over the politician had the tie breaker on their side. And, we know politicians love their perquisites. Depending on which politician was on-the-take or as they would like to have it said, "depending on which party got the politician's ear," things moved in that direction with a little help from government friends. Meanwhile though the forte of the unions was to organize employees, not all regular employees were in the union camp. These were the unorganized employees. There was no mistake then as there is no mistake today, when groups of people organize for any purpose, it is the unorganized people who are left behind with no power. There is only so much bounty and plunder to gain and so those without organized power are always destined to become society's losers, giving up their meager holdings for those organized to take them. There really is no big pot, from which to distribute to all. When a union wage is exorbitant for example, the unorganized feel the pain in their purchasing power far more than do the union members. For years, as unions grew more powerful, they represented the interests of the organized working people and the corporations represented the interests of the descendents of the wealthy Robber Barons. There were classes in America but in America, since there are no classes permitted as all men are equal under God and the law, nobody talked about it. So, we say there were / are no classes. But, there certainly were the rich and poor. There still are. There is no doubt about that. One can conclude that because of this first major countervailing power, unions, a middle class was formed in the UNited States. Ironically, in a country with no classes, there is a middle class. Without the good work of brave union organizers, the gap between poor and rich would be ever widening and thus the countervailing power brought by the unions helped all of America and all Americans. There was no longer just the rich and the very poor. The middle class did not have enough to be rich and they did not have so little to be poor. In some ways, they could see in both directions. Some middle class descendents became poor and some became rich and some stayed in the middle. Thus there were the nouveaux riche, coming from noplace to gain seats that had once been reserved for the rich alone. Unions were a major reason for enabling the emergence of the middle class. How did this happen? Over time, from their emergence during the Robber Baron years, labor unions became stronger and stronger. Owners and management had to pay attention or they risked economic loss from strikes and other union actions. Unions thus became a strong countervailing power. They got big enough to shift corporate profits from very wealthy owners to the middle class. The middle class gained better wages and unprecedented benefits. An economic side benefit was that money stayed in the hands of those most likely to spend it. Thus, with the middle class holding some of the country's wealth, this stimulated the national economy and provided more and more essential public services. Yet, despite the partial economic / neighborhood segregation, the poor for the most part shopped in the same stores and malls and paid the same prices as everybody else for their wares. So, they knew for sure that they were poor. Many of the children of the poor eventually, through major educational programs--college loans and scholarships, escaped to be successful but this story is not about that. And, yes, the middle class awaited all those who were able to make the great escape. As a point in time summary, during this period in the mid 1900's the three major forces were corporations, unions, and government. Together, the work of all three of these major forces had gotten the poor to understand the good life but in many cases the stubbornly poor knew that the next step in the "good life" was difficult if not impossible to achieve for them. Some knew they could change their lives but others felt that they had few choices. Television of course made it even worse to be poor as the poor were never exalted in TV shows such as "Leave it to Beaver." The heroes of the shows of the 1950's and 1960's were never somebody who had nothing before they became a hero. The "Beave" had the nice home with the white picket fence. It was nothing like the projects. And, so, just like the void that caused the unions to form, for government to take more of a role with the poor, there was another power vacuum. The poor were better off for sure but they had no power. They had people vouching and lobbying for them but on their own, they were powerless. The poor, other than the inalienable opportunity of all Americans to chose to become successful, which somehow had left them behind, had little control of their destiny. Living in the "projects" was a continual reminder of that. And, so, seemingly out of nowhere for many in this situation, another power group emerged. These were called community organizers. Many Americans, who had never benefitted from the power of Community organizers, were unaware such organizations, such as Acorn, a collective of community organizers even existed, and the term community organizaer was nnot in the lexicon of many Americans who had not needed their help. This movement began, shall we say, with well-intentioned people in the US. They believed intrinsically that the people who had to live in complexes or the "projects" were left out of realizing the American Dream. As in all things, this conclusion was not hard and fast as many had climbed out of their poor life through education grants and job opportunities, and they had moved on. But, it certainly was common thought. "Community organizing is a process where people who live in proximity to each other come together into an organization that acts in their shared self-interest. Unlike those who promote more-consensual "community building," community organizers generally assume that social change necessarily involves conflict and social struggle in order to generate collective power for the powerless. A core goal of community organizing is to generate durable power for an organization representing the community, allowing it to influence key decision-makers on a range of issues over time. In the ideal, for example, this can get community organizing groups a place at the table before important decisions are made. Community organizers work with and develop new local leaders, facilitating coalitions and assisting in the development of campaigns. "Organized community groups attempt to influence government, corporations and institutions, seek to increase direct representation within decision-making bodies, and foster social reform more generally. Where negotiations fail, these organizations seek to inform others outside of the organization of the issues being addressed and expose or pressure the decision-makers through a variety of means, including picketing, boycotting, sit-ins, petitioning, and electoral politics. Organizing groups often seek out issues they know will generate controversy and conflict. This allows them to draw in and educate participants, build commitment, and establish a reputation for winning. Thus, community organizing is usually focused on more than just resolving specific issues. In fact, specific issues are often vehicles for other organizational goals as much as they are ends in themselves. "Community organizers generally seek to build groups that are democratic in governance, open and accessible to community members, and concerned with the general health of the community rather than a specific interest group. Organizing seeks to broadly empower community members, with the end goal of distributing power more equally throughout the community." Community groups, such as ACORN served the poor. One of the major groups to perform community organizing functions is The Association of Community Organizations for Reform Now, which is known by most of us as ACORN. The photo here is an ACORN protest. As you can see, the protesters mean business and they exercised quite a bit of power on businesses, especially banks and bankers. To serve the poor, in this, their time of realized need, bands of people appeared, such as ACORN, who called themselves community organizers. They believed that everyone, regardless of their status in life should have the opportunity to own a piece of the American Dream, symbolized by a nice house with a garage--preferably a two-car garage. Over time, the controversial group ACORN became one of the most powerful of these community organizing groups. Before too long, the community groups began to operate as much for the good of the community groups as for the poor. The poor gained single family housing though in most cases, they could not sustain the mortgage payments. The community groups became more cash-rich and more powerful as the poor had become their means to a lucrative financial end. During Barack Obama's run for the presidency, many Americans were first introduced to the notion that there was an occupation called "community organizer," as the president posited that was his profession. A major reason people would meet a community organizer from ACORN or from another group is if they needed help in getting a home mortgage. Thus, many people in the middle class had never even heard of the term. To help poorer Americans have a shot at the American Dream, community organizers brought those with nothing, who were looking for the American Dream to the banks where they helped them obtain a mortgage. So, the poor in this scenario were being lifted from the projects to a real home. The community organizers helped give the poor the status and the power to negotiate a home mortgage with neighborhood banks. In most cases, the poor had no real income, no assets, and they had no possible means of paying back the loan. Yet, they got the loan because, quite frankly, the community organizing groups threatened the banks with a government audit. The ACORN and banking Industry relationship really was not quite so symbiotic. Left on its own, the banking industry, in my humble opinion, would not have gotten in bed with ACORN for any reason whatsoever than that they were compelled to do so by the government. Banks actually had no choice. What was the result? ACORN made a ton of money, The poor got a temporary piece of the American Dream, and banks, and ultimately, the taxpayers were left holding the bag. What's wrong with this scenario? Well, as we all know, in 2008, the bag completely burst. The overworked term, "perfect storm," applies here as the power structure was perfect for the American Dream to unfold for the poor. The government, through the Clinton-backed Community Reinvestment Act (CRA) changes in 1993, gained the power to punish banks for not loaning to minorities, or as might be termed, the "plain old poor," as reported by hard neighborhood numbers. Banks which chose not to loan to the poor, simply beacuse the poor could not pay back the loan, were finished. Community groups figured out that if they became the tattletalers, and squealed at the slightest negative action of the banks, they were in a position to better their community organizing "business" financially. And so, the groups extorted money from the banks and for the funds they received, they agreed to give the banks a good report card to the government auditors. THat's about as crooked as you can get. Eventually, because mechanisms, such as Fannie Mae and Freddy Mac were thre to buy the worthless loans from the banks, a number of banks hopped on this notion as it became good for business and the bottom line. In essence, the government paid them to make bad loans and then in 2008, the American taxpayer got the bill. This is the business in which our President engaged. How does that make you feel? Tracing through history we find that Mr. and Mrs. Clinton and many very liberal Democrats believed and many still believe that everybody is entitled to a home. I believe that also as long as everybody can afford it. The Clintons did not add the qualifier. It really did not matter to these folks whether the mortgagee ever worked a day in their lives or, if the truth be known, whether they were in the U.S. legally or illegally. Originally, there was nothing in it for the Republican Congress to give Bill Clinton this bill in 1993. Like politicians today, Clinton had to give the Republicans something to get them to go along. It may not have been the Louisiana Purchase but then-President Clinton promised the banks the repeal of the Glass-Steagall act. This was a big concession to business but not necessarily a wise one. Without this post-depression law that had kept the financial industry stable for 60 years, banks were permitted to engage in much more risky ventures with depositors' money. The combination of mortgagees not being able to pay mortgages (toxic assets), and the ability of banks to play roulette with depositor's funds had just about everything to do with the financial crisis in 2008. . While ACORN et al was hustling the banks, unfortunately they were also hustling the poor in their communities. They charged a nominal fee in the neighborhood of $100 for their services in getting poor families mortgages, whether the families could afford the $100 or the mortgage, it did not matter as long as ACORN got paid. Additionally, the new homeowner often got a mortgage with lousy terms. That as much as anything else created the conditions for eventual foreclosure. On top of it all, community groups like ACORN found other ways to get money from the taxpayers. In the last several years for example, they received about 40% of their money from US in direct payments from the government. Various governmental agencies doled out big bucks to ACORN and others for one reason or another. This bubble that burst in 2008, was inflated first by Clinton, and then George Bush did nothing to stop it. Bush knew that illegal aliens somehow were able to get mortgages for homes they otherwise were not able to afford. It got so bad as the banks were trying to prove the loans were worthy that they began to accept statements from ACORN that showed the "undocumented income" of "undocumented people" on the plus side of the books to help assure them getting a mortgage. Acorn referred to this as "under the table money.' They clearly were aiding in people avoiding paying taxes but no charges were filed. Apparently George Bush liked the fact that illegal aliens were taken care of in the US as it seemed good for the businesses who would employ them. Both George Bush and Barack Obama and the whole Congress seem to look the other way when non-citizens are fleecing the public treasury. As hard as it is to believe, the government, in concert with the newest countervailing power, the community groups , theoretically representing the poor, were responsible for delivering the American Dream to the poor. The CRA law actually encouraged community groups to market loans to targeted groups and they would collect various fees from the individuals and from the banks. In essence, the "regulators" imposed an "Affirmative Action" approach to CRA. In most cases, to book the loan, bank officers had to relax the credit standards of the bank to get the loan approved. So, banks were trained to cheat by the federal government. Banks also learned how to minimize their own risk. Yet, by 2007, as the price of housing began to drop, the financial party was just about over. The community organizers had become the fourth great US countervailing power along with corporations, unions, and government. Were they needed? They surely thought so. They orchestrated so many wonderful things for poor people that, after the down payment to them, many families actually believed that what happened to them was a miracle. It actually was a miracle and as most things that apepar to be miracles, it was unsustainable. The Community Reinvestment Act gave the poor the advantage over the banks and said basically that sanity was no longer important in lending. Eventually, as Banks were selling their mortgages to the unknowing investment community and the price of homes began to decline, or not increase, there was no escape for somebody who really could not afford the mortgage in the first place. They could no longer sell the property and win a huge sum for appreciation. Homes stopped appreciating in value. People got stuck and could not get rid of the home. The Ponzi scheme fostered by our government, dishonest banks, and sheisters from community organizing groups was just about over. So, the poor people with mortgages that were huge could not keep "their" new properties because they could not afford the monthly payments when they finally came due. So, what could they do? They would ultimately default and hightail it out of town. This created the recession of 2008, which almost became the second great depression. It happened because Jimmy Carter in 1977 and Bill Clinton in 1993 created bad legislation, and because George Bush for eight long years, permitted it to be the law of the land. So now the new President, Barack Hussein Obama, at this time of great trouble decided to solve the problem by throwing gobs of taxpayer money at it as did George Bush several months earlier. Words emerged that had seldom been used in the US lexicon, such as TARP, stimulus, bailout, and porkulus. These became bywords on the American landscape. The people were saying no tarp, no stimulus, no bail outs, and no porkulus, but our unresponsive representatives in the corrupt 111th Congress felt they knew better. So, in summary the banking crisis came about by governmen deisng. The fourth countervailing power, community organizers, emerged and began to direct the flow of capital its way. The unorganized poor got new homes for wahile at least but the unorganized from the middle class were the ones hurt as they funded this largesse with tax dollars, a huge deficit, and major long-term debt. Look, up in the sky, it's a bird, no it's a plane, no it's Superman. Someone else said, " that Mister Trouble always hangs around, til he hears this mighty sound, -- "Here I come to save the day -- that means that Mighty Mouse, is on his way. Then people began to gain the scent of TEA in the air. It is as pleasant a scent as the scent of freedom. The people had been sold down the river by their government, and the Pelosi-Reid-Obama machine kept slamming Americans until it hurt so much that regluar Americans began to organize to protect themselves from all of the others who had previously organized against them. But, just before the scent of TEA came in 2009, the United States had room for just one Superhero. His name of course is Barack Hussein Obama. He probably is not a bad guy after all but everything he touches turns out bad, and he began to want to touch everything and amass more power than any president. But, he had no idea how to be a good presideint other than giving person X's income to person Y. Then, he gave person X's healthcare to person Y. Between these two give-aways, the TEA party was formed to help stop him in his tracks before he completely destroyed America. With his thoughtful gifts in 2009 to US Citizens, right after the porkulus and the bailout snafus, such as the proposals for Cap and Trade, and Obamacare, and his 40 brand new Marxist czars, amidst the longest recession since the deep depression, regular Americans began wondering what was happening to America? Another power void surely had been created. Many people lost half or more of their retirement savings in just a few months. There was another need for countervailing power. This time, it was driven by the middle class in response to all of the shenanigans and the complicity of the corrupt 111th Congress who, by the way, should all be sent to jail. Congress. The middle class had emerged as the new unprotected class, and it needed protection big time. Since government was still for the benefit of politicians, corporations were still for corporations and owners, unions were still for unions and their members and leaders, and community organizers were for community organizers and the poor, the middle class, who were supporting this huge burden had been forgotten. And so, there was yet another power void. Whenever there is a power void, it will eventually be filled as the seemingly powerless realize that in numbers, they have power. The middle class and the small business people across the US as well as some from the ranks of the poor and the rich have become "mad as hell" about the pure buffoonery of our government. The leaders of this government have become actual caricatures of themselves. Hearing after hearing with one buffoon after another speaking in buffoonish, the government clearly thinks it has limitless resources. Worse than that, it thinks its only solution is to spend every dime in the whole world to satisfy its perceived needs. Our government is still hell bent on continuing to bail out every special interest so they cannot fail while adding so much national debt that the country itself is now in danger of failing and defaulting on its debt. Ask Jim Bunning! And, so people by the millions began writing Congress and making their concerns known. Congress, for the first time that I can remember clearly told the people that the Congress knew better and ignored the cards and letters and the spirited debates in the Town Hall Meetings. So, with Congress completely unresponsive to the cries of the people, the people had every reason to feel completely helpless, at the mercy of a corrupt government, and without power to play in a brand new game. Many hard working people are still being hurt today and will continue to be hurt by policies that elevate the needs of the certain people over people who provide the work engine for the country. People have a right to expect that by working hard for themselves, they should be able to keep the fruits of their labor. Redistribution of wealth and the redistribution of healthcare are the new mantra of Congress and the President. This is not cutting it with the people at large. These are the basic tenets of socialism, and that is not the American way. Americans have decided that enough is enough. The people at large have been neglected by corporations, by unions, by government, or by community organizers and thus, there is a large void to fill. Let's hear it for the TEA Party! 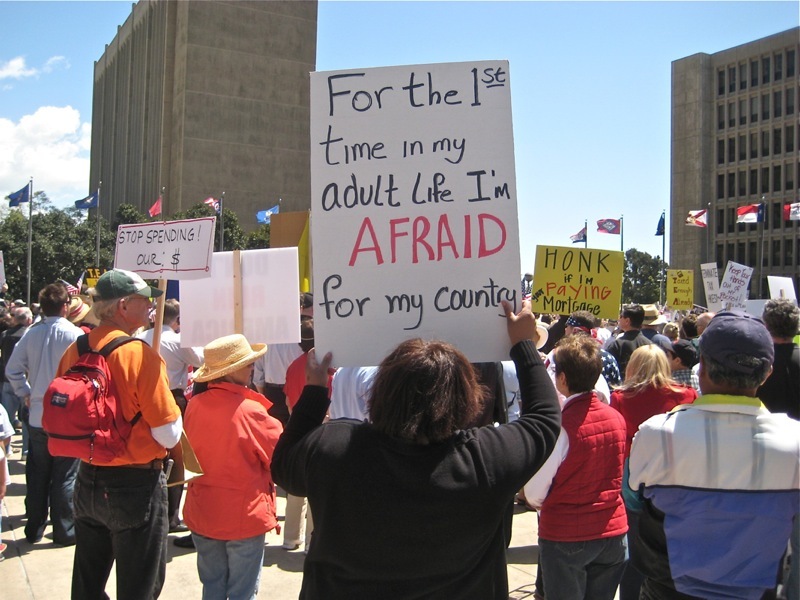 The TEA Party is the new countervailing power. Quiet for many years, the discontent today is boiling over and the TEA is brewing. The simple reason for the TEA party is that government has gone astray. There is a strong feeling among those TEA-party-inclined that government has been taken from the people. And the people want the government – and the country – back. NOW! • The TEA is HOT for the long haul! • Big government doesn't work! There are over 100 slogans, precepts, objectives, desires, and love affairs, in the naked TEA Party. These are just several of them. There are lots more to come. Keep your eyes open. While all this trauma was taking over the United States, I became active in writing government / political books. I titled my first non-tech book, book after thirty-eight technical books as Taxation Without Representation; subtitled, Can the US Avoid Another Boston Tea Party. So, even before the Tea Party became our salvation, I am pleased that I recognized the need.